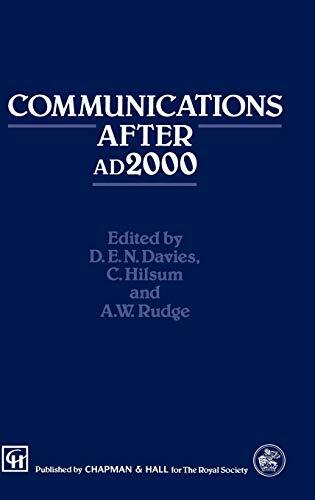 Communications After 2000 Ad (Techno Logy In The Third Millennium): 9780412495502 Hardcover - LIMEROCK BOOKS INC. The Royal Society has initiated a series of meetings to discuss the effect advances in technology will have on our way of life in the next century. The two previous meetings have been concerned with housing and waste treat­ ment. The subject of the third meeting, communications, is no less critical to life, but it offers particular problems and uncertainties, especially in the forecasting of future trends. Indeed, some have doubted if there can be profitable debate on long-term development in such a fast-moving field. The importance of the topic justifies an attempt, and the reader will judge whether the authors have met the challenge. Communications today bears little resemblance to that of the 1970s. Then we knew about satellites and optical fibres, and we had seen lasers and silicon chips, but most of us could never imagine the potential of the new technologies within our grasp. We had also not assessed the thirst of the popUlation for more and better ways of talking and writing to each other. It was the combination of market need and technical capability that created the com­ munications revolution.